The Galland poem reminded me of the Garnier dedications… These 4 sonnets come from Ronsard’s ‘uncollected works’ which is to say they are dedicatory poems written to go in the front of books of Garnier’s works. They demonstrate that Ronsard could exaggerate and be adulatory with the best (or worst) of them, and provide some amusing but often frankly beautiful little poems well worth seeing more of. Marty-Laveaux collected these & others into an “Autre recueil des sonnets” (‘another collection of sonnets’), Blanchemain into “Sonnets diverses” (‘various sonnets’) – neither very inspired titles. Of the 4 Garnier sonnets to come, only the first two are in Marty-Laveaux. De ses vertus sera le guerdonneur. Digne où les Grands lamentent leur fortune. En ce bel art où la gloire est commune. Will honour him for his virtues. Worthy for the greats to lament their fate. In this fair art in which glory is common. The “cothorne” (‘cothurnus’ or buskin) is the traditional footwear of antique actors – rather like the leather boots strapped up the calf or lower leg which you see in pictures of Roman soldiers. Helicon is of course the home of the Muses and therefore the home of Art in all its forms. 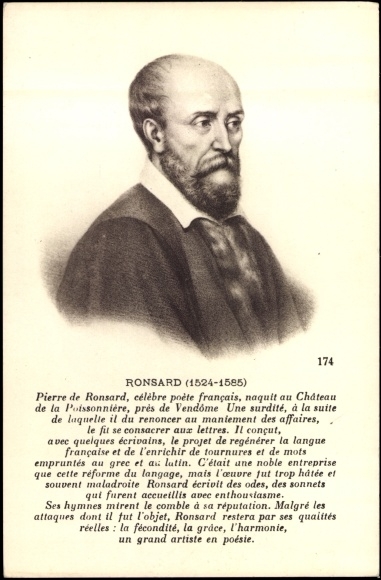 I love the last line: Ronsard says ‘glory is common’, perhaps meaning glory is shared by many great writers, but it’s hard not to see him as hinting strongly that it’s just too easy to gain glory with stage works, where the quality of the poetry may be overlooked amongst so many distractions…!